If you want a chance to talk to Palm Coast business owner Heather Thompson, it’s not hard. Everyone knows Heather to be a social butterfly–and that she talks to everyone. 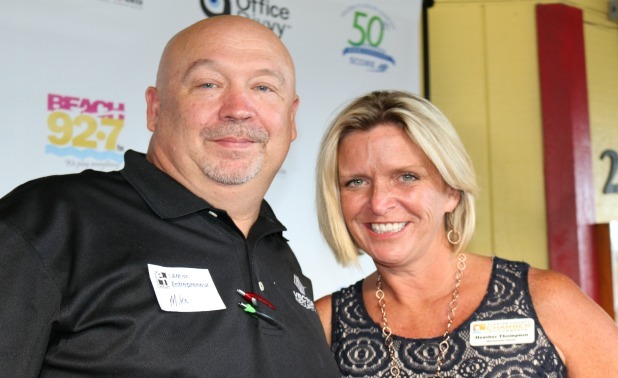 Heather is near constant presence at every Entrepreneur Night and any ribbon-cutting, and any major event you can think of here in Flagler County. That last bit, of course, is partly because it’s her job–her business–at HT Production Company–an event company that she’s helmed since she started it midway through 2015. But it’s also just who she is, which is why one day she had a reason to make it her business, officially, when the time arose. For as long as she’s been here, Heather has made it a mission to attend these events, and the word “mission” is not being arbitrarily used here. If you get the chance to ask her about herself (in the moments when she’s not trying to introduce you to someone she thinks can help you), you will hear from her something rather surprising. She suffers from what, from the sound of it, can be described as a near debilitating case of social anxiety, though it was worse after she first moved to Palm Coast exactly five years ago to the day. Yet, you only have to talk to Heather for a minute to realize that the person in front of you is–or at least appears to be–one of the most outgoing people you’re likely to ever encounter, in Palm Coast or somewhere else. Yet her upstart HT Production Company specializes in grand openings, ribbon-cuttings, etc., or any other type of small business production launch: It creates the hype. It also makes her, in her words, “The business connector,” which is what Entrepreneur Night is all about at the end of the day. You’d think being such an introvert would make that difficult. Well, it does, she said. At the early entrepreneur nights, she’d be looking for an escape every five minutes, whether it be the parking lot or slipping into one of the European Village restaurants. Her reasons for coming back then–she was at the very first Entrepreneur Night–was to promote the Grand Haven Golf Club, where she was membership director. This came after a dramatic change of scenery. Her boyfriend Pete (who is also now an entrepreneur in his own right), then working for a US defense firm, was transferred from Atlanta to St. Augustine to work on E2 Hawk Eyes (United States military planes) and Heather followed, leaving behind a long career in medical equipment sales. “I went from 18 divided lanes of bumper-to-bumper traffic for six hours to, ‘Oh, look, a stop sign…So it was getting back to your grassroots, I think…It was just getting back to yourself and building relationships. '” Of course, that was the hard part. Entrepreneur Night, you could say, was the first leap over the hump towards reaching Heather’s own ribbon-cutting. When she was in medical sales, golf tournaments were inherent to that business structure and culture, and she was constantly having to involve herself with them. So it made sense after arriving here, knowing no one, to try to get a job like the one she ended up getting with Grand Haven. At Entrepreneur Night, her first goal was marketing the golf club’s space, the amenities and the club. After talking to enough people, she decided it would be in her best interest to join the Flagler Chamber of Commerce and finally got the corporate office in Texas to sign off on the decision. One thing led to another, and it turned out that the Young Professional Group had a softball team. Heather had played softball for the best coed team in the country through college. Just because you’re shy doesn’t mean you can’t be fierce, especially when you know you’re good at something. A trait she would need later. The cannon ball rolled forward and suddenly Heather was membership director for the Flagler County Chamber of Commerce. And that’s where the critical learnings came in for baby, HT Production, when it came time to chart her own way. Heather had spent so much time talking to business people at the Chamber, making sure that they were taken care of, learning their daily and unique difficulties within the business climate, their pet peeves. She was building relationships–listening and learning what she could do to help them. But she never considered that she could be a business person herself. She still gives full credit to the support of all her chamber contacts for reaching the entrepreneurial trajectory that has been catapulting her forward for years–which is why her story is so worthwhile for us here at Entrepreneur Night. Heather grew up as the youngest of four siblings. One of her older sisters, Alice, is a political pundit for CNN, who has also helped run the presidential campaigns of numerous candidates over the past couple of cycles. Alice, Heather said, was always battling folks telling her she couldn’t do it, and she uses that for inspiration. When we caught up with Heather at the first January 2017 Entrepreneur Night, in European Village, we were polling every attendee about how they thought 2016 was for their business and how they anticipated the year ahead. At the start of 2016, Heather had been in business for just six months. For many business owners, and really just about everyone, 2016 was a tumultuous time–for many reasons, which we don’t need to get into. We’ll just say that many of the entrepreneurs in our midst were happy to see the year closed out. On a scale of 1-10, Heather gave the year a four, and not just because that was her softball number in high school, she said. “But no, it was a tough year, last year,” she said. “My first year was really difficult to find that niche. It took a while to figure it out, but I think it’s coming together fairly well…” which translates to a ten looking ahead to this year. Today, it’s still a daily struggle to put on the right face, she said. But she does it with gusto and aplomb. It’s not only inner battles, though, she said. There are still the external, physical ones, too. Every Sunday, for example, Heather runs the gourmet farmers market in European Village, helping to break down 50 or so tents around the plaza. But it’s the small successes she witnesses that warrant her optimistic outlook. “If you look at our Farmers’ Market now, five of our original vendors that got started at the Farmers’ Market now own their business or their own shop,” she said. In other words, a price. I have accomplished much in life , and people like Heather Thompson have taught me so much along the way ! Heather is a person who stays out of politics, shows respect to all and motivates others to succeed in their chosen field. 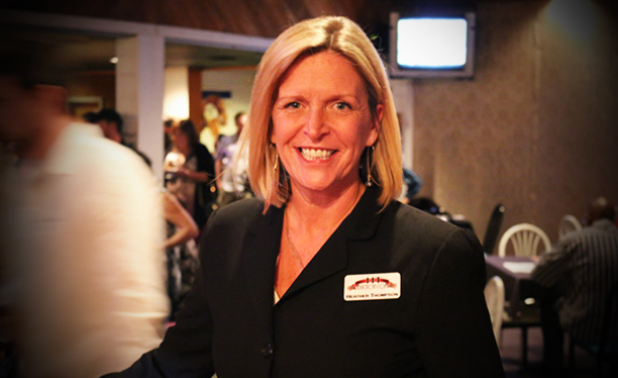 In short Heather is a person you can trust and believe in , her Legacy will continue in a positive manner . I am Honored to call her my friend. My goodness Heather look slike her mom, Carolyn (RIP). That energy come naturally since all the Fraker folks are go-getters, highly energetic and very smart!